Every year the birthday of Prophet Muhammad (pbuh) is celebrated with a variety of different activities in parts of Europe. In nearly every country of Europe, Muslim populations come together to meet on this blessed night, to pray and celebrate together. For instance, in recent years, women organizations in the UK have marked the occasion of the Mawlid. 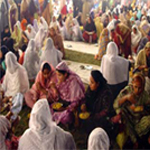 Commonly held in community centers, these programs begin with the recitation of the Holy Quran, and continue with speeches about the important role these organizations play in strengthening the bonds between Muslims; there is the a recitation of nasheeds (Islamic hymns) in different languages by Muslim women from various ethnic backgrounds. After the program, a feast is organized for the guests. Furthermore, outside of London more extensive organizations that attract thousands of participants (men and women) hold celebrations all around in the country. A wide range of activities are arranged, such as conferences, lecture series, seminars, speech competitions, quizzes, Mawlid parades, recitation of the Holy Quran and praise and salaams to the Prophet. In Spain, a European country with a very large Muslim population, the celebration of the birth of Prophet Muhammad dates back to the history of Andalusia. The Mawlid celebrations became an officially recognized holiday in Egypt and North Africa during the 10th - 11th centuries and after the holiday became popular in North Africa in the late 13th century (as it still is today), it quickly spread across to Nasrid Granada. It was traditional to celebrate the Mawlid in a festival mood; such celebrations occurred throughout the western Islamic world in the late Middle Ages as well. "The gastronomical aspect of the program included dinner, a late-night snack, and breakfast the next morning. A wide range of food was served to the guests. Dessert would have consisted of pastries made with sugar and rose water and fresh fruits, such as cherries and apples from Granada, dried figs from Almuñécar, and pomegranates and grapes from Málaga. Germany and France, countries where large populations of Muslims have immigrated in the past, are two other European countries where Mawlid is celebrated. In Germany, Mawlid programs are arranged and Muslims gather together in mosques and halls to celebrate the birth of the Prophet. In France, celebrating the birthof the Prophet Muhammad has become a tradition in recent decades and Mawlid festivals have been organized for more than ten years in various cities of the country. 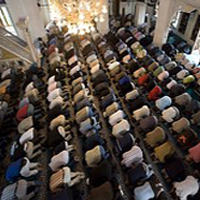 In other countries like Belgium, the birth of Prophet Muhammad is celebrated with a wide range of activities, just as in the other European countries, but the Mawlid celebration that was held in the historic Belford Church in 2004 is the most noteworthy Mawlid celebration to occur to date in Belgium. 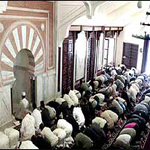 In Poland it has become traditional to perform prayers in mosques and to visit relatives and friends on this blessed day, whereas in Russia, activities are organized in concert halls with the participation of many leading religious commissaries, members of the Russian parliament, a number of academics, authors and people of different ethnic backgrounds. Poem competitions are arranged to select the best poem to express love for the Prophet. Islamic songs are sung by music groups and children. One of the most enthusiastic celebrations is that of the Ukraine. The office of mufti in Ukraine organizes activities for Mawlid and the day is celebrated in large halls with thousands of people participating. The program begins with a recitation of the Quran. Nasheed groups sing Islamic hymns in Arabic, Russian, Turkish and Tatar. The life of the Prophet is told accompanied by a beautiful visual representation. After the program, Mawlid candy is distributed by children to the guests. In Denmark, there are women associations who organize celebrations for Mawlid. Within the program, great naat/nasheedcompetitions are held for different age categories. The program begins with the recitation of the Holy Quran after Dhohur prayer. Then nasheeds are sung in praise of Prophet Muhammad and speeches are made about the significance of the Mawlid. After presents are distributed to the women and children, the program ends with salaams being sent the Prophet and prayers. The Mawlid of Prophet Muhammad is celebrated in Austria in different ways, depending on the congregation. 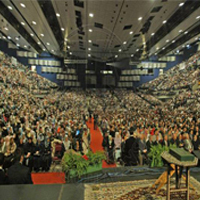 While some congregations do not celebrate Mawlid, those that do hold Qur'an recitations and put on performances by Islamic music groups in halls or mosques, which are attended by thousands of Muslims living in Austria.The Mawlid of Prophet Muhammad is celebrated in Austria in different ways, depending on the congregation. While some congregations do not celebrate Mawlid, those that do hold Qur'an recitations and put on performances by Islamic music groups in halls or mosques, which are attended by thousands of Muslims living in Austria. In Holland, the birth of Prophet Muhammad is celebrated with various activities. Large organizations that last for many days are held in halls and people of different ethnic backgrounds (Moroccan, Arab, Turk, Dutch etc.) are invited. The life of Prophet Muhammad is related to the guests. On the roads, roses that have a small piece of paper with hadiths on them are given passers-by. Aid and food are distributed. Young girls, whose parents generally prefer to go to the mosques for the celebration of Mawlid, gather at each others houses to celebrate the birth of the Prophet. The program begins with salaams being sent to the Prophet, and then the significance of this greeting is explained. Prayers are performed in congregation and there is a recital of the Quran. In keeping with the Sunnah, milk and dates filled with walnuts are served to the guests. The life of the Prophet Muhammad (pbuh) is told with a visual representation. Poems are recited and Islamic hymns are sung. The program ends with a congregational prayer. At the end of the night, everyone becomes "dua sisters" . In Greece, thousands of Muslims gather together and march to Syntagma Square in the capital Athens reciting Islamic songs to celebrate the birthday of Prophet Muhammad. Then Holy Quran is recited and the program ends with a mass prayer. Please type '762' into this field.